CIA promises no more fake vaccination campaigns after Bin Laden raid linked to polio outbreak. 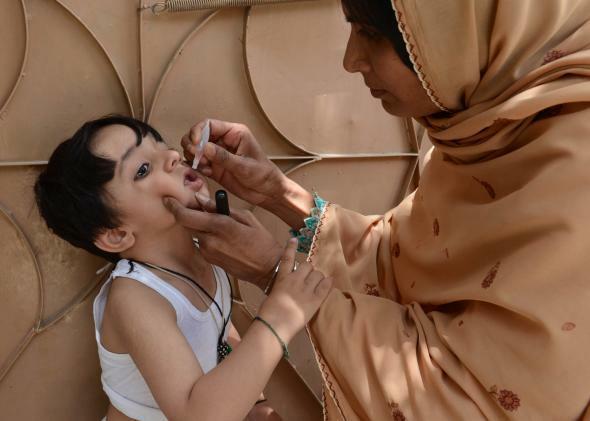 A Pakistani health worker administers polio vaccine drops to a child in Quetta on May 12, 2014. The World Health Organization recently reported that after years of decline, polio is starting to make a comeback. It’s a worldwide problem, but one country in particular stands out. Of the 77 cases of polio detected this year, 61 were in Pakistan, where health workers have been frequently targeted for killing, torture, and intimidation by the Taliban. The campaign isn’t entirely to blame—Taliban opposition to vaccination campaigns predates the bin Laden raid – but Abbottabad operation did help extremists portray vaccination as part of a western plot and didn’t exactly allay the concerns of suspicious parents. “I wanted to inform you that the Director of the Central Intelligence Agency (CIA) directed in August 2013 that the agency make no operational use of vaccination programs, which includes vaccination workers,” President Obama’s top counterterrorism and homeland security advisor, Lisa Monaco, wrote to deans of 12 schools of public health. Yahoo News obtained a copy of the May 16 letter. The letter came after the deans had written a letter to the White House demanding that public health campaigns not be used as cover for intelligence-gathering operations. This is a welcome development, though in the case of polio in Pakistan, the damage is likely already done. *Correction, May 19, 2014: This post originally misspelled Yahoo News reporter Olivier Knox’s first name.